Home » Posts Tagged "R.F. 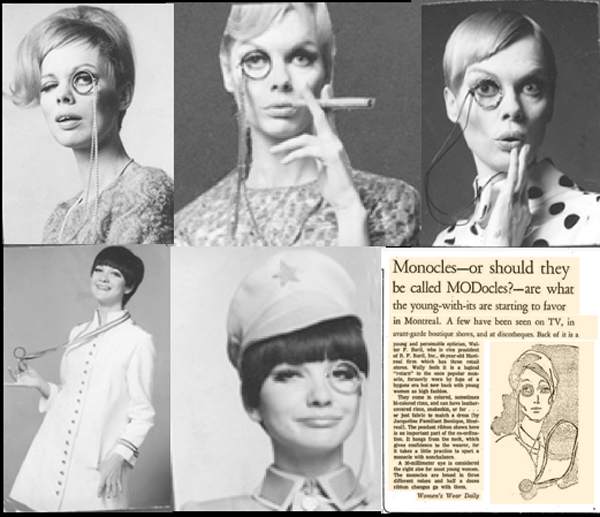 Baril"
“Monocles – or should they be called MODacles?” said Women’s Wear Daily in a ’60s article on “what the young-with-its are starting to favor in Montreal.” The photos here, which I produced and did PR for, are from contacts but you can get the idea. Walter F. (Wally) Baril, VP of R. F. Baril, a 40 year old Montreal firm with three optician retail stores at the time, felt it was a “logical return to the once popular monocle, formerly worn by fops of a bygone era.” The monocles came in colored rims – leather-covered, snakeskin, or fur, or could be a fabric to match a dress. They came boxed in three different colors and with a half a dozen ribbon changes. A favorite was one rimmed in black and white stripes (top right.) It just takes a little practice to wear a monocle but the fashion impact would be worth it. What fun? Anyone want to start the fashion fad for the 21st Century? Hair: Charles Booth, La Coupe, Montreal, ’60s … Model Top Row: Ulla Moreland.